Rabbits are not as common a pet as dogs or cats, so video examples help a lot to explain what rabbit people mean when they say "binkie". Traditionally, rabbits have been placed in outdoor hutches and not interacted with as members of the family. With the video clips on these pages we hope to give you some idea of why and how these adorable animals have made such an impression on us, and why keeping rabbits indoors is the best way to enjoy their company and enrich your life and theirs. The rabbits shown are typical of house rabbits. They were rescued, spay/neutered and adopted into a home where they are loved & enjoy plenty of play and exercise time, a healthy diet, and lots of care and attention. In rescuing rabbits, our members are exposed to the full range of the animals' personalities. This is part what makes fostering so rewarding: you see the full potential and range of behavior of rabbits. You get glimpses of joyful & adorable behavior you might not otherwise. You realize each rabbit is an individual and precious. More videos will be added in the following months. Also check out the National HRS video channel on YouTube. Rabbits are playful and funloving. 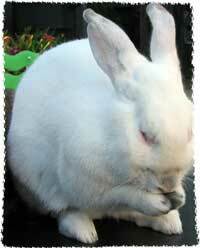 Like many pets, rabbits enjoy or appreciate the attention from grooming care. Bonding is sometimes a very involved procedure which takes an indeterminate about of time. It is difficult to know how & when to procede to the next level without injury or hurt feelings. We provide some examples of what to look for to help your rabbit find a life-long friend.